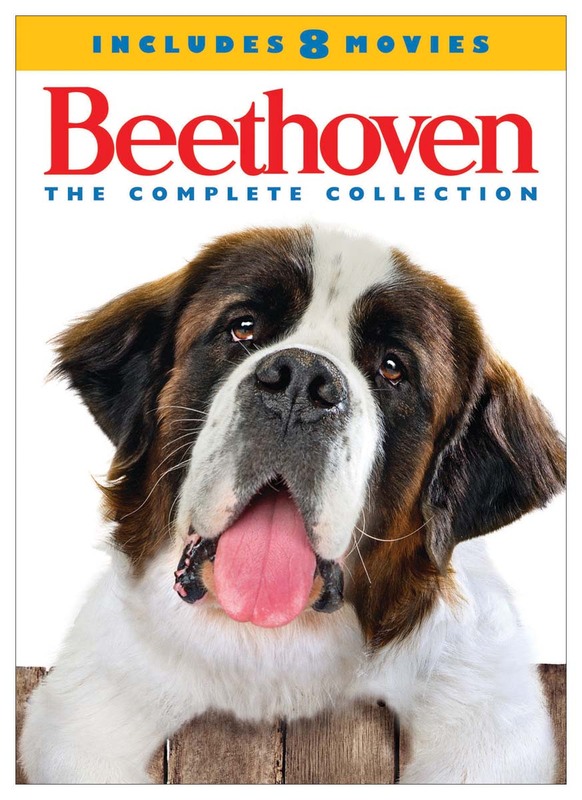 Four-disc set includes:Beethoven (1992)He's a loveable, huggable, somewhat klutzy St. Bernard that everyone in the Newton family loves...except daddy George (Charles Grodin), who keeps fighting a losing battle to get rid of the monstrous pooch. Will Beethoven be able to win him over by saving the family and stopping the scheme of a nasty veterinarian? Bonnie Hunt, Dean Jones, Nicholle Tom, David Duchovny co-star; co-written pseudonymously by John Hughes. 87 min. C/Rtg: PGBeethoven's 2nd (1993)Everyone's favorite trouble-prone St. Bernard is back, and this time he's bringing the family with him! The doggone delightful follow-up to the hit comedy finds Beethoven in love and playing proud papa to a litter of puppies, much to the consternation of Dad (Charles Grodin) and the delight of his kids. With Bonnie Hunt, Debi Mazar, Chris Penn, Nicholle Tom, Christopher Castile. 89 min. C/Rtg: PGBeethoven's 3rd (2000)Richard and Beth Newton (Judge Reinhold, Julia Sweeney) and their children find their peaceful vacation plans turned upside-down when brother George's slobbering Saint Bernard, Beethoven, enters their lives. The pooch keeps getting into trouble, but he sure comes in handy when some nasty crooks try to dupe Richard and his family. Frank Gorshin and Michaela Gallo also star. 99 min. C/Rtg: GBeethoven's 4th (2001)Beethoven rolls over once again, this time switching places with a pampered look-alike pooch from a wealthy family. Thanks to his irascible antics, Beethoven forces his "owners" to pay more attention to their neglected daughter, but there's trouble when dognappers target the rich clan's home and get the uncontrollable Beethoven instead. Judge Reinhold, Julia Sweeney, Joe Pichler, Matt McCoy, and Dr. Joyce Brothers star. 94 min. C/Rtg: GBeethoven's 5th (2003)That lovable canine Beethoven finds a $20 bill that turns out to come from a treasure buried during the 1920s. Soon, a number of greedy people want to befriend Beethoven in hopes he'll lead them to the hidden fortune, but there's a surprise that comes with the money--something that's hiding in the woods. John Larroquette, Faith Ford, Kathy Griffin, Dave Thomas, Tom Poston, and Daveigh Chase star. 91 min. C/Rtg: GBeethoven's Big Break (2008)A Hollywood animal wrangler and single dad (Jonathan Silverman) disappoints his young son (Moises Arias) when he tells him they can't keep a lovable stray St. Bernard. But he changes his tune when a canine movie star goes missing and he recruits Beethoven to take his place. Rhea Perlman, Stephen Tobolowsky, Joey Fatone, Eddie Griffin star in the sixth entry in the fun family franchise. 101 min. C/Rtg: PGBeethoven's Christmas Adventure (2011)One of Santa's elves (Kyle Massey) accidentally goes rogue, crashing Santa's sleigh in a small town where crooks promptly seize St. Nick's magic toy bag. Can our canine hero Beethoven (voiced by Tom Arnold) and his young pal (Munro Chambers) catch the greedy grinches and restore the joy of the holiday season to one and all? This charming entry in the "Beethoven" series co-stars Kim Rhodes, Robert Picardo; narrated by John Cleese. 90 min. C/Rtg: PGBeethoven's Treasure Tail (2014)The brave St. Bernard named Beethoven is back for another whimsical adventure! This time, Beethoven and his trainer (Jonathan Silverman) come to the aid of a new young friend (Bretton Manley) trying to save his coastal hometown from being taken over by a nefarious businessman. To do that, they'll need to use a pirate map to locate some hidden treasure...and they'll need help from everyone in town! Co-stars Morgan Fairchild, Kristy Swanson, and Udo Kier. 98 min. C/Rtg: PGWidescreen (Enhanced); Soundtrack: English Dolby Digital 5.1; Subtitles: English (SDH), French.